Good afternoon guys, how's it going? I'm so looking forward to so much needed gaming time tonight. I haven't even turned on my PC for like three days now and it's been killing me. Just in case you're wondering, I usually do all my nail blog stuff on my laptop for less distractions. So after a few swatches, I'll be getting my inner geek on haha. 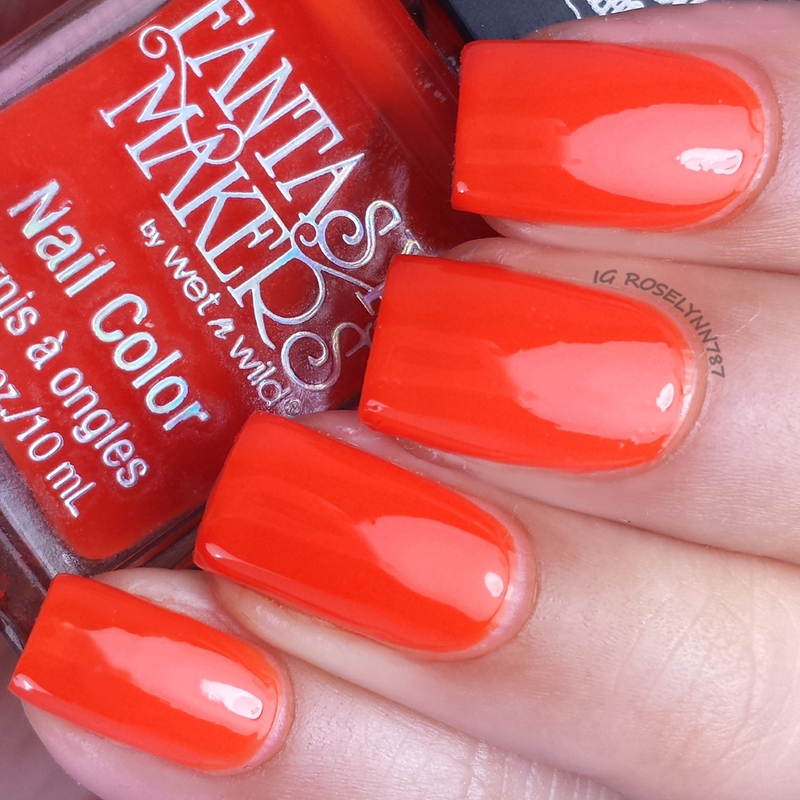 For today's afternoon post I have another great set of Halloween polishes. These set of five are the Fantasy Makers 2014 Collection by Wet n Wild. You may recognize these as the cute colorful polishes with the tombstone caps we see released every year. This was actually the first I was able to get the majority of the collection. The only one I wasn't able to purchase was the glow in the dark one, but I wasn't too concerned with finding it. Aren't they so full of 'pop'? 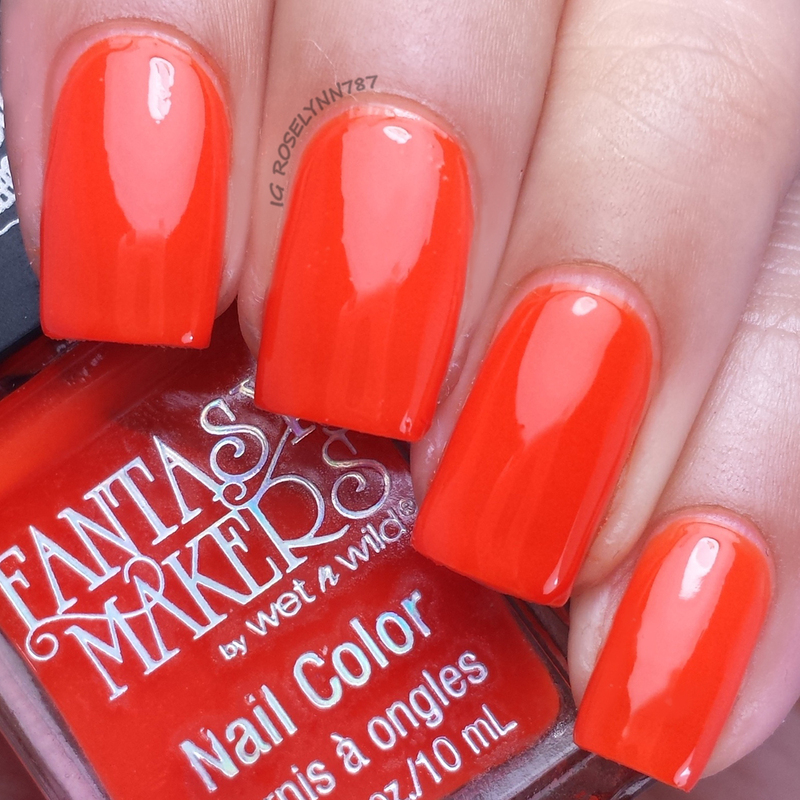 The Fantasy Makers 2014 Collection by Wet n Wild has been on the shelves for at least the past month. Unfortunately time is running out in order for you to grab these beauties for yourself. I didn't even see the display last weekend at Target anymore. So if you're interested definitely don't wait much longer. Roach Busters is a lime green shimmer creme polish. I gotta say the name kind of made me giggle, haha. Out of all the ones I'll be showing you today, this one is the only one with a shimmer finish. I really ended up liking this one a lot more than I thought I would. I intend to use this one quite a bit as it makes for a nice very base for nail art. It also has the best formula of the bunch and a nice even consistency. For these swatches, I used two thin coats and sealed it with a topcoat. Ghouls Rush In is a vibrant fuchsia pink jelly. If I had to chose a favorite, this one would definitely be it as it a great shade all year round. You have the option to layer this over a base to have the color pop and to get a more opaque finish. If you choose to not layer it, then you'll have to use about three-four coats and it will still be a bit sheer. Another thing worth noting is when layering, do wait a bit before adding coat and coat otherwise you'll experience some clumping. 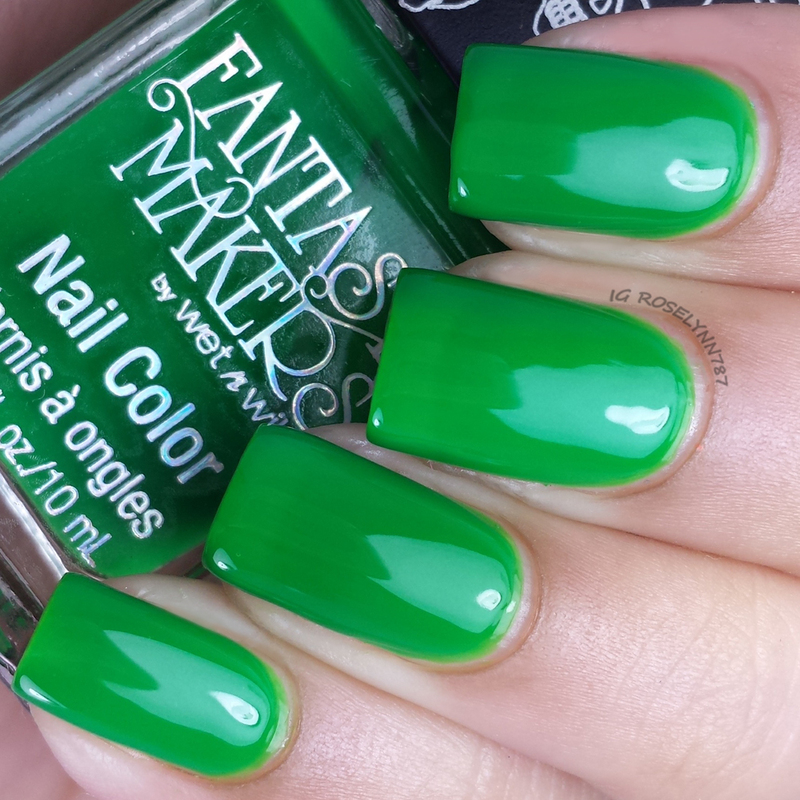 Queen of Envy is your standard green jelly shade. Not as exciting as Roach Busters and I have read online that it is a close dupe to one of the ones from last year. Since I didn't get any last year (or maybe just one), this one was worth picking up for me. The formula is identical to Ghouls Rush In and will need a base color if you want it fully opaque. For these swatches, I used four thin coats over a clear base coat and sealed it with a fast drying topcoat. Witch Black is the classic shiny black creme. Not much to say about this one, haha. It's the classic and practical straight black polish. This one is definitely skip-able if you already have a favorite black. The formula is nice, but it does require at least three coats for full opacity. I did also use a topcoat with these swatches to enhance the natural shiny finish. Goosebump Suit is a very bright shade of orange hinting at red. It's also a jelly polish as some of the others and will need a few layers to be opaque. As I mentioned before, however, you can layer this over white as well for more opacity and a brighter look. I was very nervous this color would end up staining my nails really badly, but thankfully that was not the case at all. Great formula and nice consistency, it applied with ease. 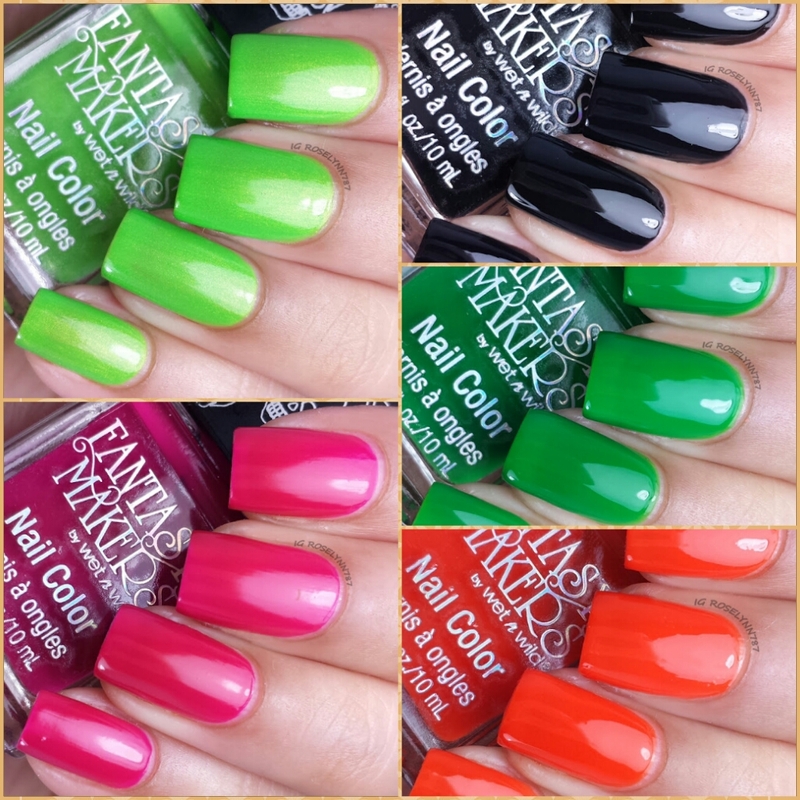 For these swatches, I used three-four thin layers over a clear base coat and sealed it with a topcoat. 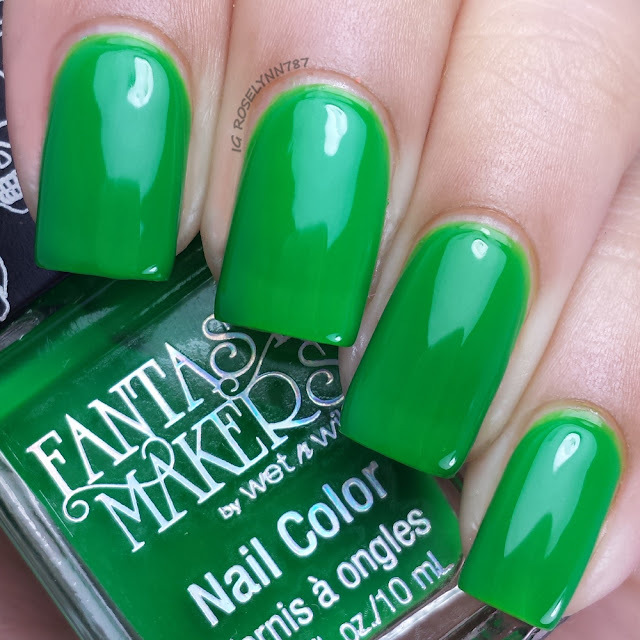 Overall I really like this year's set of Fantasy Makers by Wet n Wild moreso than other years. While the colors may be something you similar in your collection, I personally didn't so it was a nice addition. Like I always do, I tested these against stamping and watermarble. The verdict is no on the stamping but a big heck yeah on the watermarble. I'll be showing you the marble I came up with probably tomorrow. As I mentioned before, if you think you might be interested in picking these up you might want to do so asap. These won't be around for much long as they are Halloween limited editions. I believe I ended up purchasing them from Target for about $1.99 each. So guys tell me, which one did you like? Did you get a chance to grab any of these?